Finding drugs capable of inducing miR-7 could therefore prove to be an effective treatment against the progression of gastric cancer. Gastric cancer is the fourth most common cancer and the third leading cause of cancer-related deaths worldwide, according to the National Institutes of Health. miR-7, which is frequently decreased in gastric cancers, can stop the cancer cells from spreading to other tissues by inhibiting a particular growth factor receptor (called IGF1R). Whether miR-7 also suppresses earlier stages of gastric cancer is unknown, however, so researchers in China screened for new targets of the microRNA. Dai-Ming Fan and colleagues found that miR-7 directly targets the genes RELA and FOS, which encode proteins involved in the pro-oncogenic NF-κB and AP-1 signaling pathways, respectively. In human gastric cancer samples, low miR-7 levels correlated with elevated levels of RELA and FOS proteins and poor patient survival. Increasing levels of miR-7 reduced RELA and FOS levels and inhibited tumor growth in mice. 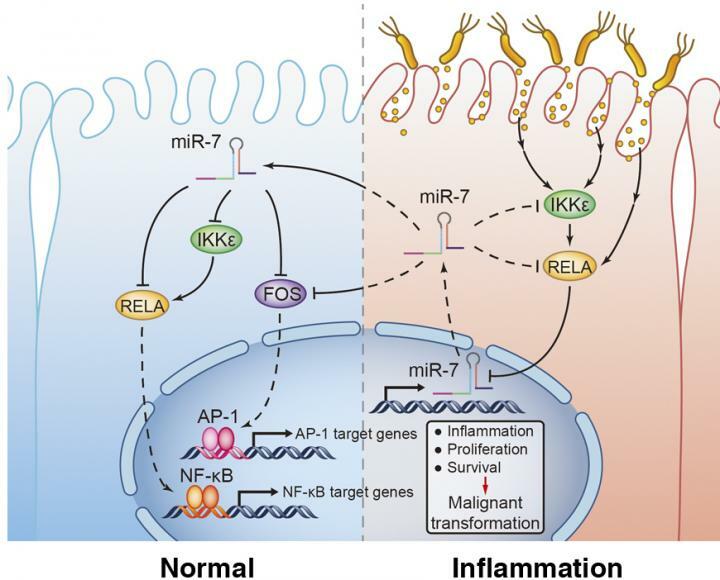 The researchers found that, as well as directly suppressing RELA expression, miR-7 could control the protein's activation by targeting its upstream kinase (IKKε) in the NF-κB pathway. Yet, this same pathway was itself able to repress miR-7 expression, indicating that miR-7 would be unable to restrain RELA's activity if the NF-κB pathway were strongly activated. Chronic H. pylori infection is a major risk factor for gastric cancer, in part because the bacterium can hyperactivate the NF-κB pathway. Accordingly, Fan and colleagues found that culturing H. pylori with gastric cells activated IKKε and RELA, and reduced the expression of miR-7, a potentially key step in the transformation of healthy gastric cells into malignant ones.